Low Vision is any visual impairment not correctable by standard glasses, contact lenses, medicine, or surgery that interferes with a person’s ability to perform everyday activities. 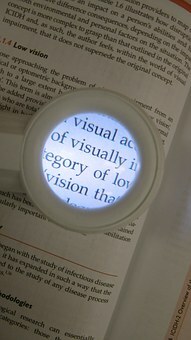 Low Vision can result from a variety of diseases, disorders, and injuries to the eyes. Currently, there are over 14 million Americans and about 135 million people around the world who suffer from Low Vision. It is estimated that 17 percent of people over the age of 65 are either blind or have low vision. If you or anyone you know notices trouble with reading, recognizing the face of friends, or trouble reading signs or starts having other vision difficulties, they should immediately make an appointment with an eye care profession. If a person’s vision cannot be treated by conventional methods, they should seek information about vision rehabilitation; which may include a low vision evaluation and training on how to use visual and adaptive devices, such as magnifiers, talking phones, large display clocks, currency readers and big button remotes.